You can almost detect when Oscar season is approaching. It’s not that the leaves change colour, nor is it the appearance of snow, or any media-related hype. No, you can map its arrival by the genre of films that are spewed out by Hollywood. Once the sumemr blockbusters are over, you get the tired out films that weren’t good enough throughout September… then you get the autumnal blockbusters. But then… then you get the dramas. Generally those about real life struggle. War’s quite a hot topic in recent years. But let’s not forget that this is ‘merica… and what do we want from an American film? Probably something either pro-US or heavily US-centric. So looking over the release schedule we can see a lot of movies about war (again), as well as that classic card… race, and slavery. Let’s all welcome The Butler – the first of this season’s retrospective look at black history in the US. The Butler, along with 12 Years A Slave, represents the tried and true offering of race-based cinema entertainment. It’s Oscar-bait and unshamedly so, one would presume. Will it get this Oscar? Well… I’m not so sure. That’s not to say that The Butler is a bad film; it’s very watchable. But you can’t help but feel a touch of deja-vu. No, not because it retells the real events that occurred in the US between 1951 and the present day in relation to Civil Rights and equality… no, it’s more because it feels like you’re watching Forrest Gump again. Let me keep no secrets from you: Forrest Gump is a fantastic film in our eyes. Thoroughly entertaining, heart warming and funny on occasion too. All the time set against the backdrop of the big events of the 20th Century. We saw Tom Hanks meet Elvis, fight in Vietnam, help get Richard Nixon impeached and start up Bubba-Gump. Forrest Gump was a very clever film and was shot very, very well. I just couldn’t shake the feeling that The Butler was trying to recapitulate the feelings generated by that film! 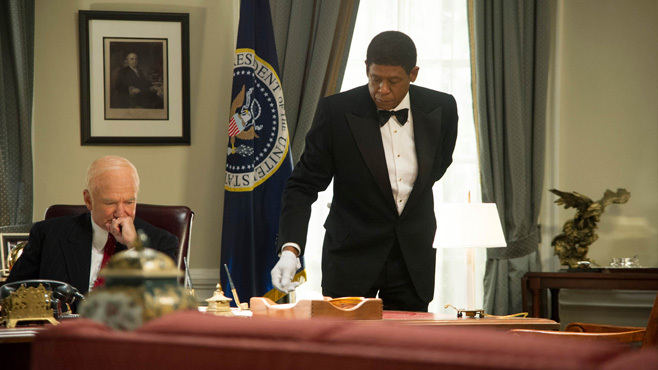 The Butler stars Forest Whitaker (see – another Forrest / Forest!) as the eponymous butler, Cecil Gaines. Brought up on a cotton plantation and shaped by his upbringing as a house servant following his father’s death, he eventually becomes hired as a butler at The White House serving President Eisenhower. Gaines stays there through the decades of black oppression that would follow and sees Presidents come and go over time. At the same time, he has to balance his home life with his wife (Oprah Winfrey) and sons. 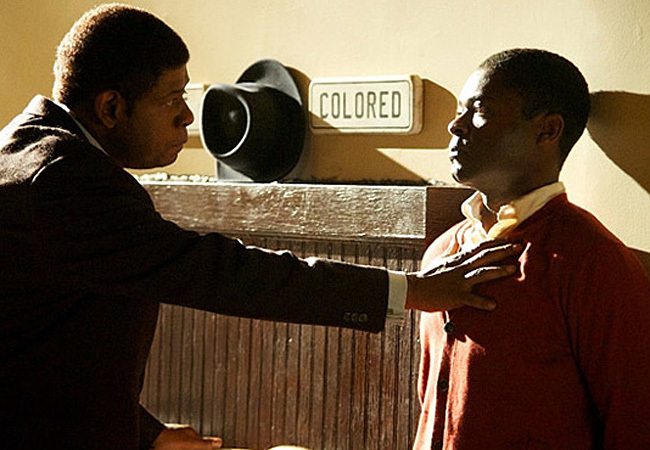 One of whom, Louis (David Oyelowo) becomes deeply politicised and works his way through most of the black power groups of 1960-1980, including the Freedom Riders and Black Panthers. This combination of Cecil and Louis’ lives fills in the bulk of what The Butler is about. As I say, The Butler is far from a bad film. It’s really enjoyable and it’s delivered really well. This is of course due in no small part to the fantastic ensemble cast, including Robin Williams, Vanessa Redgrave, Terrence Howard, Cuba Gooding Jr., James Marsden, John Cusack and Lenny Kravitz amongst many others. It’s a sensational casting coup and it’s always a gentle thrill to see a recognisable actor appear throughout the 2 hours of the film. Speaking of run time, the film never really feels bloated either. It flows well and doesn’t dwell too long in any particular era, just like Forrest Gump before it. However, where it fails to meet Forrest Gump‘s high standards is in its ability to make you simultaneously laugh and cry. The smiles are there (just not laughter), but the tears? They fail to form. Forrest Gump‘s finale has every person capable of displaying emotion in tears. You know the bit I’m on about – where Jenny passes away (not a spoiler… the film’s almost 20 years old!). The Butler fails to do this. Indeed, I found the ending particularly hard to stomach. It all just seemed too saccharine and “go USA!” at its conclusion. For a film that had spent so long highlighting the dirty underbelly of what is essentially “modern” days USA, the end just felt too contrived and forced to give that “hell yeah, we’re a great nation” impression. I get why it was done: things coming full circle, but it felt hammy and literally had me squirming in my seat. 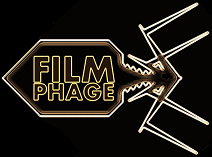 It instantly dropped half a Phage for the ending alone. As I say: a really good film, but not without its flaws. These flaws certainly don’t lie in the casting, especially Forest Whitaker who is sublime, as always. It’s just… it’s just not Forrest Gump. 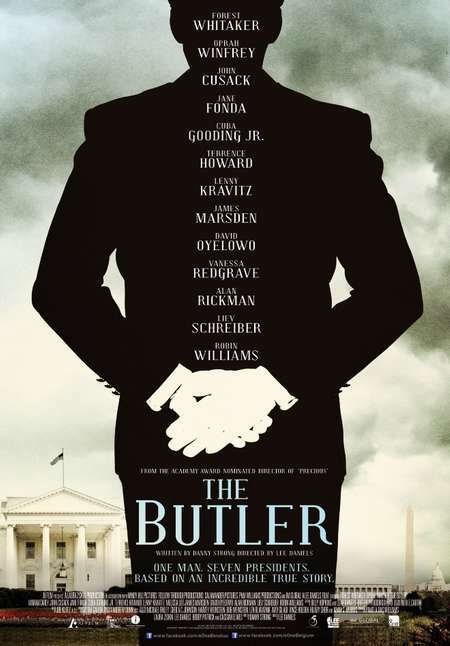 The Butler is a valiant first entry into what is sure to be a crowded pre-Oscars film season. We can wave goodbye to the popcorn marathons and engage in some more lofty sounding films. Whilst I certainly don’t feel that The Butler will pick up any Awards come February, it can stand tall as a solid film. Even if it does come a bit close to mimicking what’s gone before. 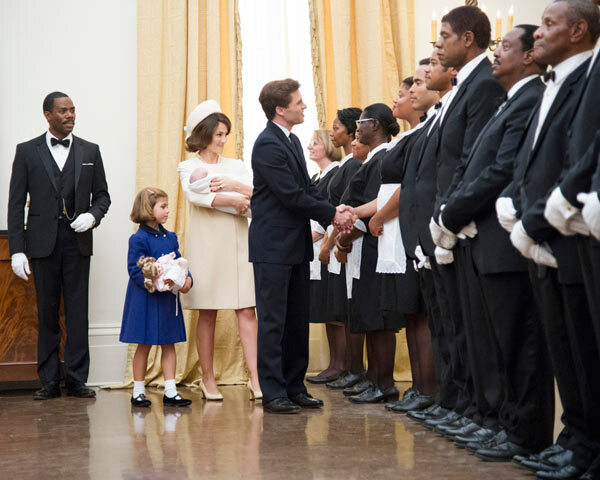 Maybe it’s telling that I keep comparing The Butler to Forrest Gump. To me, Forrest Gump feels like it came out yesterday and not 20 years ago. Time flies. But it all seems very “now”. Maybe I shouldn’t be comparing to a film that is essentially over two decades old. But then again, if it quacks like a duck, waddles like a duck and swims like a duck… well, it’s probably a duck. That’s what momma woulda told y’all. This entry was posted in Review and tagged 1960's, Black Panthers, black power, ensemble, Forest Whitaker, Forrest Gump, KKK, Oprah, Robin Williams, The Butler, US politics, US president. Bookmark the permalink. Yeah, the Oscar-bait is all over this one, however, that’s not as much of a bad thing as it’s just something that gets splashed with this movie. There’s a lot of interesting stuff that Daniels does with this material and never has it come off as preachy as it probably would have been coming from someone like Spike Lee. Good review. Ah Spike Lee… Oldboy will be next up for us here. Not expecting much, so I should be pleasantly surprised… I hope!! I did enjoy The Butler though. – really pleasant, fun film!